Membership at St. Louis Aerial Collective is a way for established students to accelerate their progress by taking advantage of as much training time as they need. Standard membership affords unlimited open practice as well as one free Circus Circuit™ class per week. Premium memberships include unlimited open practice, unlimited Circus Circuit™ classes, flexible SLAC time practice* (level 1 +), and discounts on all in-house series classes. See table below for details of member benefits. 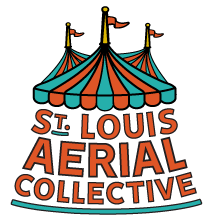 Become a member of our vibrant community of circus artists and make St. Louis Aerial Collective your aerial home! Practice any time an instructor is in the space and there are apparatuses available. Students who have completed one session of Intro to Horizontals or Verticals are welcome. SLAC time is supervised but self-directed. No new material will be taught at this time. All open practice rules apply. Check calendar for times and availability.